Tindora / Tendli is chopped into circles and fried in oil till golden brown in color. Once cooked, tindora fry is finished with besan / gram flour and spice powders. Serve tindora besan fry with steamed rice and dollop of ghee. 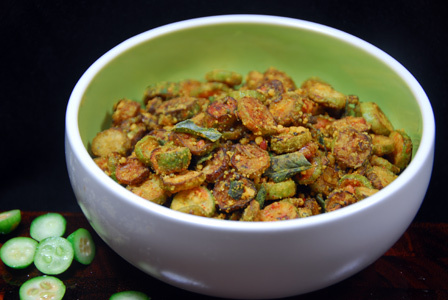 Makes: around 4 Servings of Tindora Besan Fry. Wash, remove little bit of both ends and chop the tindora into thick circles. Soak tamarind in few tablespoons of water and extract the thick pulp. Heat oil in a pan, add sliced tindora and fry on medium flame for around 10 – 15 minutes. Once tindora turns golden brown and cooked, add half a tsp of oil in the middle of the pan. Add all talimpu ingredients in order. When mustard seeds start spluttering, add besan and let the besan toast a bit. Then stir in tamarind pulp, red chili powder, turmeric powder and salt. Let it cook on low flame for few minutes and remove from heat. Serve tindora besan fry with steamed rice and dollop of ghee. Notes: Make sure to fry the tindora well. Suggestions: Adjust besan and red chili powder according to your preference. Variations: Check other recipes with tindora here. Other Names: Tindora Besan Fry, Dondakaya Senagapindi Vepudu. Fresh fat mild green chiles are stuffed with gram flour mixture. They are then cooked in oil till light golden brown on all sides. 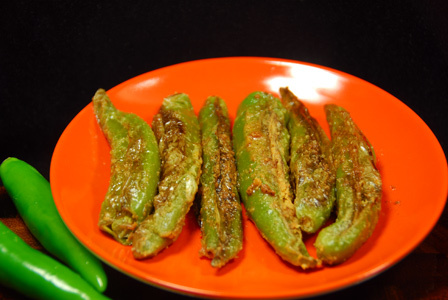 Serve besan stuffed chiles with steamed rice and dollop of ghee. Makes: 6 Besan Stuffed Chiles. Remove stems, wash and pat dry green chiles. Slit the stomach of the green chile making sure its ends intact. In a mixing bowl, mix together 2 tablespoons of oil, besan, red chili powder and salt. Taste and adjust seasonings if required. Stuff each green chile with besan mixture and keep aside. Heat oil in a pan on low-medium heat, add stuffed green chiles. Cook on all sides till the skin of the green chile changes color. Remove onto plate and serve besan stuffed chiles with steamed rice and dollop of ghee. Notes: Make sure to deseed the green chiles to reduce the heat. Variations: You can also add a pinch of ajwain to the besan mixture. Other Names: Besan Stuffed Chiles, Pindi Mirapakayalu. 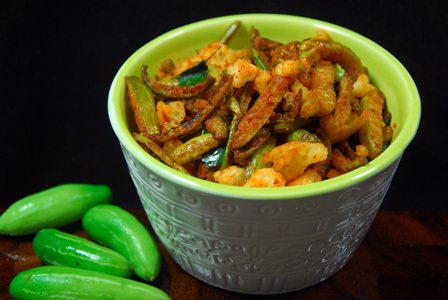 Aku pakodi is famous among savory snacks in Andhra. Aku pakodi are made by a special instrument called jantikalu maker with a rectangular perforation plate. Here, rice flour and gram flour is mixed with hot oil and water into a soft dough. This dough is extracted through the jantikalu press and deep fried till they turn light golden in color. 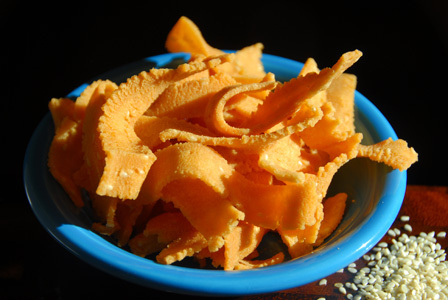 Makes: around 3 Cups of Crispy Rice Flour Snack. Heat 1/8th cup of oil to smoking point and remove from heat. In a mixing bowl, sift rice flour, gram flour and salt. Add the sesame seeds, red chili powder and mix well. Slowly pour the hot oil into the mixing bowl and knead the mixture. Add enough water to the mixture and knead till it forms into a bit loose wet dough. Divide the dough into 2 portions. Insert a handful of dough into murukulu maker / muruku press. Choose the disc with rectangular perforations in it. Heat oil in a deep frying pan on medium – low heat. Slowly press and move the muruku maker in circular motion to let the dough strips drop into hot oil. Deep fry the pakodi until light golden color on both sides and remove onto a absorbent paper. Repeat the same with the other portion of the dough. Make sure the aku pakodi / rice flour snack are light and crisp, else deep fry again till crisp. Store tight in a jar and serve aku pakodi as a tea time snack. Notes: Make sure not to over fry the aku pakodi. Adjust the flame occasionally to let the oil have a constant temperature. Suggestions: If the dough is too tight and doesn’t come through the murukulu press, mix in a few tbsps of hot water into the dough and try again. Add a tbsp of melted butter to the dough if aku pakodi comes out hard to bite after deep frying. Variations: Check other snacks here. Other Names: Aku Pakodilu, Crispy Rice Flour Snack. Bendakaya Senaga Pindi Gutti Kura. Stuffing is prepared with besan / gram flour. 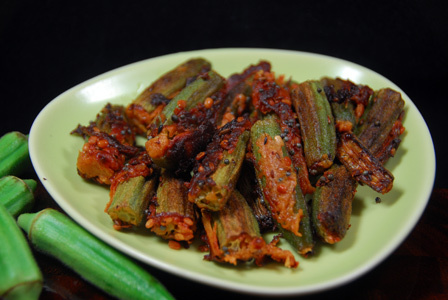 Lady’s finger or okra is stuffed with prepared besan mixture. They are then fried in oil along with spices till golden in color. The flour stuffed bhendi tastes good with steamed rice and dollop of ghee. Wash thoroughly and pat dry bhendi. Remove ends and slit the bhendi vertically keeping the ends intact. In a mixing bowl, mix together besan, yogurt, lemon juice, ginger garlic paste, coriander powder, red chili powder and salt. Prepare the mixture into thick paste. Adjust yogurt or besan if necessary. Stuff the bhendi with the prepared besan paste. Heat oil in a wide pan on medium heat, add all talimpu ingredients in order. When mustard seeds start spluttering, carefully add the stuffed bhendi. Cook covered for around 5 minutes until bhendi pieces turn little soft. Uncover and fry the cooked bhendi until it gets light golden all around the edges. Roast bhendi to the required preference and remove from heat. Serve flour stuffed bhendi with plain steamed rice, or with roti or chapathi. Notes:Make sure to scrape the bottom of the pan to avoid burning of any stuffing. Suggestions: If bhendi feels raw, put back in stove and fry till cooked. Other Names:Besan Stuffed Okra, Flour Stuffed Bhindi, Bendakaya Senaga Pindi Gutti Kura. Tindora / Tendli is sliced and fried in oil. Besan fritters are prepared with gram flour and they are crumbled. Tindora curry is finished with crumbled fritters and can be served with with steamed rice and few drops of ghee. Makes: around 2 Servings of Tindora Fritters Curry. Wash, remove little bit of both ends and slice the tindora. Make 6 slices out of a tindora if they are fat else make 4. In a mixing bowl, mix together besan, soda bi carb and salt into thick paste adding just enough water. Heat oil in a small pan on medium flame for deep frying. When oil gets hot, scoop besan mixture with a spoon and carefully drop into oil. Repeat with remaining besan mixture as well. Fry till the fritters turn golden brown on all sides. Remove the fritters onto absorbent paper. When warm enough to handle, crumble the fritters into small chunks and keep side. Heat oil in a pan, add tindora and fry for few minutes. Add salt and cook covered on low flame for around 3 – 5 minutes or until tindora changes color and starts to soften. Uncover and fry the tindora on medium flame to brown the edges. Stir in crumbled fritters, curry leaves, red chili powder and salt (if necessary). Mix thoroughly and remove from heat. Serve tindora fritters curry with steamed rice and few drops of ghee. Notes: Make sure tindora is cooked well. Suggestions: Adjust spice with red chili powder. If tindora is not cooked well, put it back on heat and cook covered till done. Variations: You can also start the fry with talimpu (mustard seeds and cumin seeds). You can also chop the tindora into circles instead of slices. Other Names: Tindora Fritters Curry, Dondakaya Bajji Vepudu.